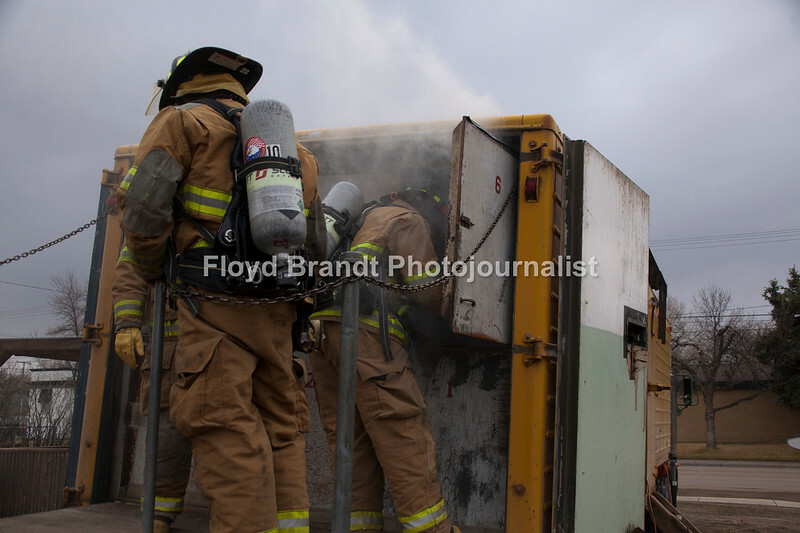 Smoke poured out of a trailer parked at the Havre Fire Department where Firefighter Chris Cox enters the Confined Space Training trailer Monday Austin Shupe waits and watches for his turn at finding his way through the small space. The traing helps the firefighters prepare themselves for entering a fire that may be very confining and dangerous. Assisant Fire Chief Kelly Jones said that it gives his firefighters a chance to get use to their equipment and gear in small spaces and to look out for hazards. For Chris Cox, "It was tight and you can't see anything but it was a lot of fun," he said.